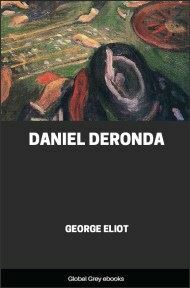 Daniel Deronda contains two main strains of plot, united by the title character. 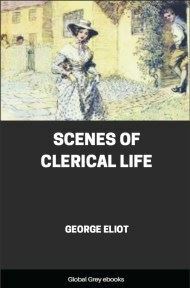 The novel begins in late August 1865 with the meeting of Daniel Deronda and Gwendolen Harleth in the fictional town of Leubronn, Germany. Daniel finds himself attracted to, but wary of, the beautiful, stubborn, and selfish Gwendolen, whom he sees losing all her winnings in a game of roulette. The next day, Gwendolen receives a letter from her mother telling her that the family is financially ruined and asking her to come home. In despair at losing all her money, Gwendolen pawns a necklace and debates gambling again to make her fortune. In a fateful moment, however, her necklace is returned to her by a porter, and she realises that Daniel saw her pawn the necklace and redeemed it for her. From this point, the plot breaks off into two separate flashbacks, one which gives us the history of Gwendolen Harleth and one of Daniel Deronda. Was she beautiful or not beautiful? and what was the secret of form or expression which gave the dynamic quality to her glance? Was the good or the evil genius dominant in those beams? Probably the evil; else why was the effect that of unrest rather than of undisturbed charm? Why was the wish to look again felt as coercion and not as a longing in which the whole being consents? She who raised these questions in Daniel Deronda's mind was occupied in gambling: not in the open air under a southern sky, tossing coppers on a ruined wall, with rags about her limbs; but in one of those splendid resorts which the enlightenment of ages has prepared for the same species of pleasure at a heavy cost of gilt mouldings, dark-toned color and chubby nudities, all correspondingly heavy—forming a suitable condenser for human breath belonging, in great part, to the highest fashion, and not easily procurable to be breathed in elsewhere in the like proportion, at least by persons of little fashion. It was near four o'clock on a September day, so that the atmosphere was well-brewed to a visible haze. There was deep stillness, broken only by a light rattle, a light chink, a small sweeping sound, and an occasional monotone in French, such as might be expected to issue from an ingeniously constructed automaton. Round two long tables were gathered two serried crowds of human beings, all save one having their faces and attention bent on the tables. The one exception was a melancholy little boy, with his knees and calves simply in their natural clothing of epidermis, but for the rest of his person in a fancy dress. 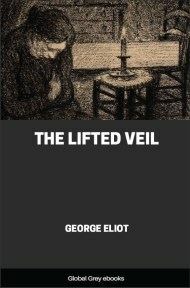 He alone had his face turned toward the doorway, and fixing on it the blank gaze of a bedizened child stationed as a masquerading advertisement on the platform of an itinerant show, stood close behind a lady deeply engaged at the roulette-table. About this table fifty or sixty persons were assembled, many in the outer rows, where there was occasionally a deposit of new-comers, being mere spectators, only that one of them, usually a woman, might now and then be observed putting down a five-franc with a simpering air, just to see what the passion of gambling really was. Those who were taking their pleasure at a higher strength, and were absorbed in play, showed very distant varieties of European type: Livonian and Spanish, Graeco-Italian and miscellaneous German, English aristocratic and English plebeian. Here certainly was a striking admission of human equality. 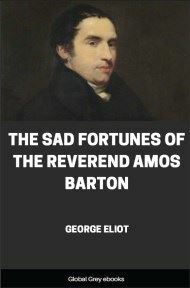 The white bejewelled fingers of an English countess were very near touching a bony, yellow, crab-like hand stretching a bared wrist to clutch a heap of coin—a hand easy to sort with the square, gaunt face, deep-set eyes, grizzled eyebrows, and ill-combed scanty hair which seemed a slight metamorphosis of the vulture. And where else would her ladyship have graciously consented to sit by that dry-lipped feminine figure prematurely old, withered after short bloom like her artificial flowers, holding a shabby velvet reticule before her, and occasionally putting in her mouth the point with which she pricked her card? There too, very near the fair countess, was a respectable London tradesman, blonde and soft-handed, his sleek hair scrupulously parted behind and before, conscious of circulars addressed to the nobility and gentry, whose distinguished patronage enabled him to take his holidays fashionably, and to a certain extent in their distinguished company. Not his gambler's passion that nullifies appetite, but a well-fed leisure, which, in the intervals of winning money in business and spending it showily, sees no better resource than winning money in play and spending it yet more showily—reflecting always that Providence had never manifested any disapprobation of his amusement, and dispassionate enough to leave off if the sweetness of winning much and seeing others lose had turned to the sourness of losing much and seeing others win. For the vice of gambling lay in losing money at it. In his bearing there might be something of the tradesman, but in his pleasures he was fit to rank with the owners of the oldest titles. Standing close to his chair was a handsome Italian, calm, statuesque, reaching across him to place the first pile of napoleons from a new bagful just brought him by an envoy with a scrolled mustache. The pile was in half a minute pushed over to an old bewigged woman with eye-glasses pinching her nose. 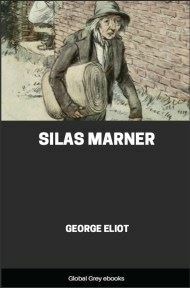 There was a slight gleam, a faint mumbling smile about the lips of the old woman; but the statuesque Italian remained impassive, and—probably secure in an infallible system which placed his foot on the neck of chance—immediately prepared a new pile. So did a man with the air of an emaciated beau or worn-out libertine, who looked at life through one eye-glass, and held out his hand tremulously when he asked for change. It could surely be no severity of system, but rather some dream of white crows, or the induction that the eighth of the month was lucky, which inspired the fierce yet tottering impulsiveness of his play. 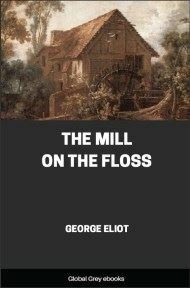 But, while every single player differed markedly from every other, there was a certain uniform negativeness of expression which had the effect of a mask—as if they had all eaten of some root that for the time compelled the brains of each to the same narrow monotony of action.